I'll slather the appropriate praise of Matt Doughty and his Glyos toyline eventually (spoiler: there will be lots of slathering), it's one of the things that got me back into painting in a big way. For now though, enjoy this custom Glyos toy, with a custom resin head from Marty 'The God Beast" Hanson. Vassal Kabuto is composed of parts from the Glyos Traveler and Buildman toys, with bits of an axis joint accessory pack, and then the resin head to top it all off. The paint job is a fairly simple one: a basecoat of Monster Kolor Gold, then layers of Monster Kolor C-Thru Chocolate. I faded the chocolate coat on the limbs and horn, I like how that turned out. Then a generous amount of MK Blue Pearl for an iridescent bug look. To give the eyes some extra visual impact, I painted them MK metallic blue, and added a large amount of MK Color-change flakes. The color change flakes create a rainbow holographic effect, and are notoriously hard to capture in pictures. While I'm satisfied with how this turned out, I should have given the basic build more articulation, and maybe some more gold highlights to bring out the sculpted detail. One last shot, trying to capture the sparkley eyes. Of the clear vinyl Grody Shogun trio I painted, this is the one that I am most satisfied with. This is the scheme I had in mind when I ordered a set of clear figures. Although I waffled trying to decide on traditional red peppermint stripes, or green spearmint. Settled on red, and Monster Kolor C-thru Bad Apple. Focusing the design on the big noggin was key. The lines are shaky (it's cold in the workshop! ), but that compliments the rough design. White paint over a silver base, with lots of white pearl and of course the stripes and clearcoat. I made an effort to keep some translucency. Shines just like a sugary confection should. He's gotten a nice reception, and now I want to do that spearmint version! Say hello to Grody Rock Candy! I love this angular, rocky sculpt (though I don't know what it's called, CCM? ), and since it looks like a rock candy lump come to life, I ran with that idea. In contrast to yesterday's "It looks better in person! Really!" here we have one that does look nice in pictures, but that I'm still not satisfied with. Painted inside and outside with a light coat of Monster Kolor Silver (Silver has become my all-purpose primer, it's great), and some white touches to vary the finish. Then I blended C-thru colors, and a coat of white pearl, glosscoated, and done! I really like the way the internal/external and silver and white base coats vary the finish. I also like the way the pearl and base silver give the figure depth, and enhance the reflective surfaces. So technically, no faults here, and it looks pretty, BUT I didn't do anything to the face but add some silver to the eyes, and there isn't much contrast in my paintjob. Because of this, I think it's lacking in personality. Maybe I'll go back and repaint the eyes. Stop in tomorrow for the last of the Grody Candy trio! 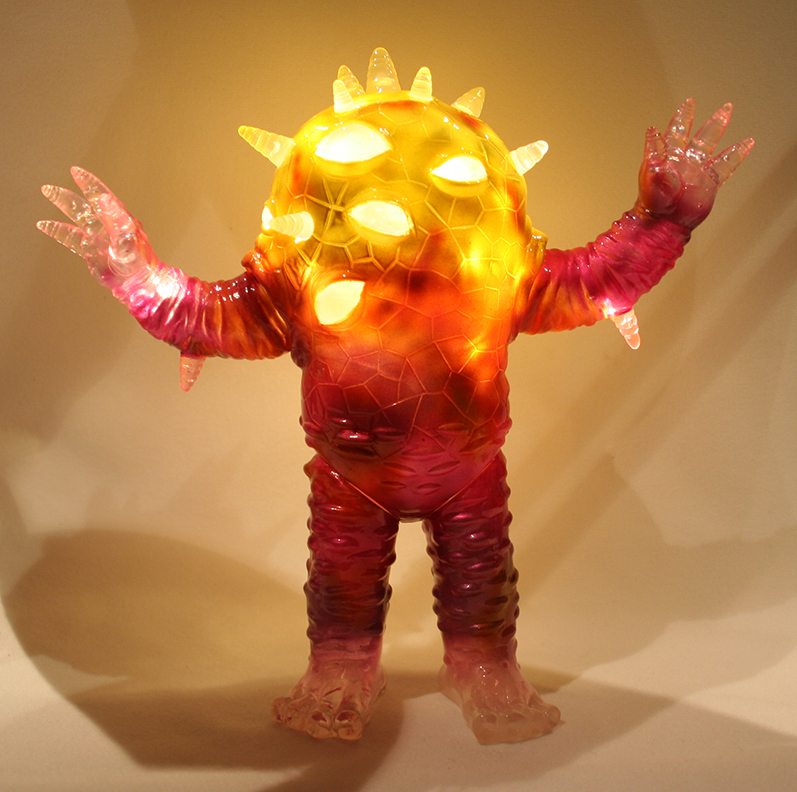 Grody Shogun from LuluBell Toy Bodega hit a sweet spot of cheap, grotesque, and cute. Luke Rook is the mastermind behind them, and they've become a darling of the Sofubi world. I jumped one the last run of clear figures. I thought doing candy colors would be keen, and when the box arrived, there was a handful of candy tossed in! Including a classic root beer barrel! Neat coincidence! But running with that idea produced mixed results. My own Root Beer Barrel is at the bottom of the curve. In person, it's a deep caramel color, translucent (Monster Kolor C-Thru Chocolate! Indispensable! ), rich, and glittery. ... But in pictures it looks exactly like a polished turd. You can see my feeble efforts to show the translucency with a flashlight. It didn't work. Painted sparingly inside and outside with silver MK as a base, then layered up with chocolate, gold, and last year's MK holiday special Snowblind pearl (a mix of gold, silver, and blue, very nifty). Learning experience: When a figure already looks like Eddy Munster after a terrible butane accident, don't paint it brown. Stay tuned for two more Candy Grodii. Micro Negora! An adorable kaiju kitty from Konatsu and Mark Nagata. He's lit the sofubi world on fire, and never stays in stock long. Fortunantly I was able to get three unpainted Micro negora the last time they were available from Max Toy Co (he also comes in Mini and King sizes). I had a horrible time photographing them. A combination of shaky hands, bad lighting, and the the fact that shimmery Monster Kolor Pearl is notoriously hard to capture in pictures. 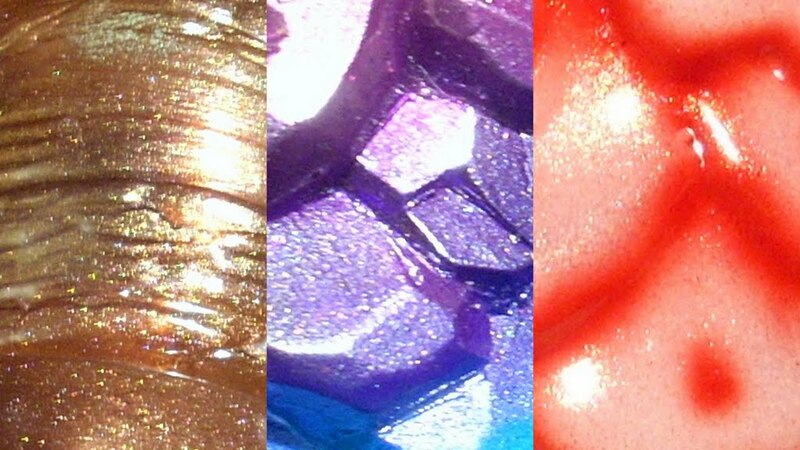 Candycat is has a gradient of eye-popping Vividtone pink, orange and yellow, with yellow-gold metallic highlights, and Pink Pearl. The pink pearl is really subtle, but it enhances the depth of the finish. I usually like to use a contrasting pearl color, but this time, I wanted the bright base colors to be the star. Starbumb received a black base coat with Bell Gold highlights, and teal and purple spots. Finished with purple and teal pearl. Influenced by one of my Mom's favorite artists, Laurel Burch, and her wildly-colored cat paintings. Mossmulch got a base coat of my favorite Green Tea Metallic with Clover Metallic, and Rocket Red metallic highlights. Green and teal pearl gives him an amazing shimmer. Green and red are one of my favorite schemes, it makes me sad when color combinations get relegated to a holiday ghetto. I went back and hand-painted each face and eyes for extra definition. Apart from my lousy photography, I'm really happy with how they turned out. Obviously, I didn't end up trying to sell anything yesterday. I still really don't have the hang of this side of eCommerce (great at the buying stuff bit). That's particularly embarrassing, since I'm an IT guy by trade. In the meantime, enjoy another picture of the amazing Glyos Armorvor, new wave coming soon from Onell. They're much better at the whole eCommerce thing! Oops. Future, hypothetical, sales through this website are postponed as I work some things out, and my paranoia dies down (I'm going to get sued! The IRS will be barking down my snorkel! They're watching meeeee!) In lieu of trying to sell something, enjoy this picture of two Glyos Armorvor that I painted a couple months ago, when the sun still shown in the Pacific Northwest. Monster Color C-Thru paints will never let you down. My two start at 2:40, but please watch the whole thing, all the pieces are incredible! Eyezon 5th Anniversary show At Double Punch! 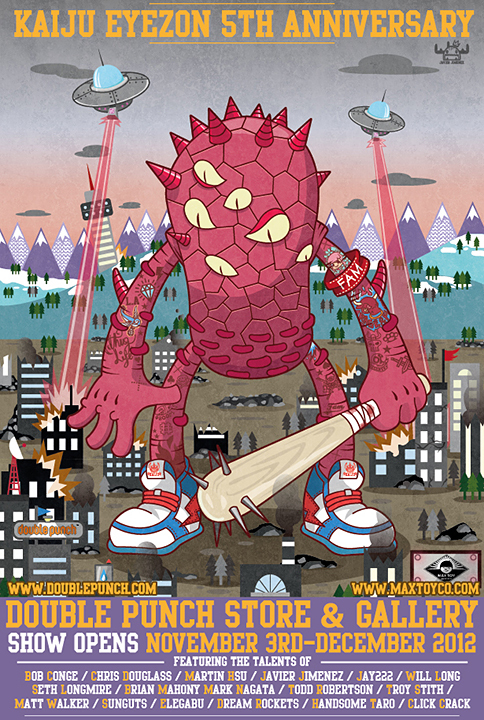 Mark Nagata was kind enough to include me his 5th Anniversary Eyezon Show at the Double Punch gallery, November 3rd! I'm honored to be a part of the show with such distinguished artists, and I hope my additions do everyone's favorite mutant potato kaiju justice! I went all out and added LED's to a big clear Eyezon, and sculpted a galactic suit of armor for Neo Eyezon! Meet GigaGuts, and Galaxy Captain Eyzono (and a sneaky micro eyezon)! With the lights out, GigaGuts really shines! Each figure is painted with genuine Monster Kolor paint and clear coat. GigaGuts has a removable back panel to swap batteries on his lights. I had originally tried to engineer a switch on his front, but that ended in blood and tears (literally, I accidentally stabbed an awl into my hand trying to fix the switch after it broke). Galaxy Capitan Eyezono was much less painful. I modified his arms with Glyos axis joints, and sculpted a galactic-themed suit of armor for his space adventures. I also ended up removing his main horns, and replacing them with more eyes, since I had covered several with the armor. Thank you again to Mark for five years of a great kaiju creation!